Zynga’s game development studios are on a roll of late, recently revealing GagaVille, and launching Settlers Of Catan-like social combat game Empires & Allies. And today, Zynga Mobile is adding one more title to the mix with the official launch of ‘Hanging With Friends,’ Zynga’s take on classic popular game Hangman within an iOS app. The game is very similar to the ‘Words With Friends’ mobile games, which was developed by mobile game developer Newtoy. Zynga actually acquired Newtoy last December. For those of you who aren’t familiar with Words With Friends (which has over 10 million users on iOS devices), it’s similar to playing a Scrabble-like word game against one of your friends. Hanging With Friends is very similar to playing Hangman, but with a mobile and social twist. In fact, the games comes with many more bells and whistles than if you played the game on a piece of paper (which I used to do as a child). You can sign on with Twitter and Facebook to see which of your friends are playing the app, and you can then challenge players to take turns creating and guessing words. Players choose their avatar and then choose friends to compete against to see who can hang on the longest. If you guess the word correctly, you can survive to play another round. If you miss a word, you may fall. In Hanging With Friends players can play up to 20 simultaneous games. 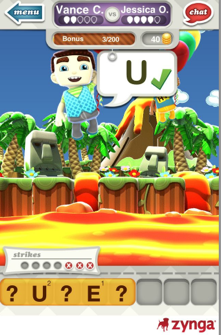 Push notifications alert players when it’s their turn and in-game chat messaging allows users to communicate outside of the game. If a player is left hanging from their friends, the game will find a random opponent as a new challenger. Players can also use lifelines that offer hints at words and watch instant replays that provide a glimpse into their opponent’s tactics. As you get words correct, you’ll earn coins that can be used for further lifelines, such as the ability to reverse a turn and get more chances to guess letters. Users can also use an ‘extinguish’ lifeline to add four words to a more complicated word. Users can also purchase these coins as a virtual currency. For now, Zynga is offering both a free and paid version of the app, which costs $0.99 in the App Store. The free version includes ads within the app, and the paid version is ad-free. Zynga’s general manager of the game, Paul Bettner says that there are no immediate plans to add the game to the Android platform. But Zynga did bring Words With Friends to Android, so perhaps the gaming giant will expand to other mobile devices with the new title. Words With Friends was a hit, so perhaps Zynga will see some success with the Hangman version. Bettner says that the UI is more interactive and creative than its Words With Friends cousin, and the game adds a layer of strategy as well. We know mobile is a significant strategic area for Zynga, so it should be interesting to see which title the gaming giant released next for the iOS or Android platforms. CityVille?